Uri Caine is best known as a genre-warping, restlessly inventive pianist and sonic thinker whose every project is as predictably unpredictable as the last. But the piano trio remains a touchstone for Caine, who returns regularly to apply his expansive imagination to that core jazz format. On his latest album, Calibrated Thickness, Caine debuts a new trio with two longtime collaborators: drummer Clarence Penn and bassist Mark Helias. "There's a lot of freedom in the piano trio," Caine says. "It's very open and loose. We keep the structure together, but within that I like the freedom it offers." 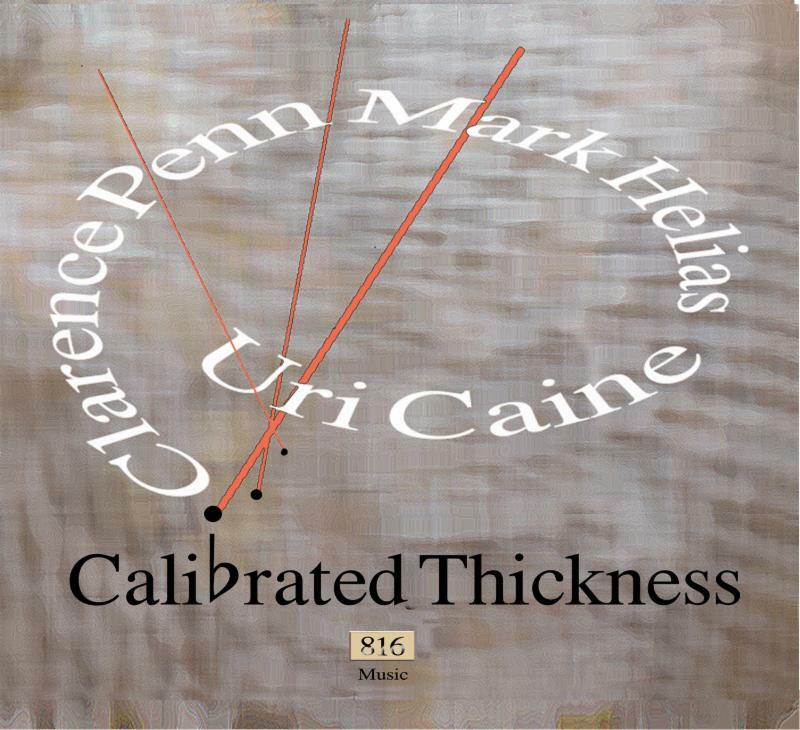 Though the title is a phrase that Caine stumbled across in a technical manual, Calibrated Thickness vividly captures the sense of controlled dynamics and calculated density that this trio so ably masters. The album's 15 songs are in a sense a distillation of the musical identity that Caine, Penn and Helias have forged over the last few years as a trio (in addition to many more in different contexts). Live, Caine's memorable compositions are landmarks that the trio happens upon in the course of lengthy improvisations, fluidly morphing from one tune to the next at a moment's whim. On Calibrated Thickness, the tunes are presented in a more pristine fashion, showcasing Caine's gift for witty, agile melodies, inspiring structures and wide-ranging stylistic approaches. The short pieces (few of which top five minutes) give the trio the opportunity to spark concise, focused improvisations from the flint of the leader's well-honed compositions. "When you're playing and writing music you're always calibrating how to build it or structure it or form it," Caine explains. The relationship between Caine and Penn dates back a couple of decades, most notably in trumpeter Dave Douglas' quintet that also featured saxophonists Chris Potter or Donny McCaslin and bassist James Genus. The pianist came to work with Helias through their shared tenure in Don Byron's band. Joining the trio on three tracks is the ingenious cornetist Kirk Knuffke, whose sharp, probing sound adds an extra edge to the pieces on which he appears. Caine offers a straightforward, no-nonsense reason for assembling this particular trio, his first release in that guise since 2011's Siren with bassist John Hébert and drummer Ben Perowsky. "I like the sound," he says, a simple enough proposition but one that can be maddeningly elusive. "I like the way Clarence accompanies and sets things up; Mark has a really warm sound and is really flexible. There's a lot of room to move with them." The 15 Caine originals contained on Calibrated Thickness run the gamut of styles, from jagged, angular modern pieces to more straight-ahead swingers that harken back to Caine's early days playing hard bop in Philadelphia (albeit with his usual idiosyncratic twists and turns) to more lyrical, ballad-inspired playing that spotlights the warm expressiveness that sometimes gets eclipsed by his bold eclecticism. The album kicks off with the powerful, rollicking swing of "Manahatta," titled for the original Lenni Lenape name for the island at the epicenter of the jazz world. "Woke Up This Morning" uses a blues cliché to label a piece of pure, rattletrap abstraction that depicts the trio's explosive spontaneous interplay. That tune contrasts sharply with the shimmering, delicate "Icicles," highlighted by Helias' moving lyricism, eventually consumed by the tune's surging roar. Knuffke makes his first appearance on the zigzagging "Submission," while "Golem" offers a round of broad-shouldered, barrelhouse swing. "Bleeding Heart" is remarkably hushed and intimate, the album's quietest, most delicate moment despite building with nervous intensity. "Night Wrestler" is bright and buoyant, "Climb To the Top" barbed and dissonant." Knuffke returns to provide darting, keen-edged lines on "Hidden Glances," while "Scatterbrain Suite" offers a slapstick soundtrack for an imaginary silent film. Caine's playing on "He Said She" sparkles with classical elegance and hymn-like simplicity, while "Sticks and Stones" dances with brisk soulfulness. Helias' tense, scraping bowed bass pairs with Penn's jittery rhythms to give "Time in Between" its frenetic urgency, while "Shadow of a Doubt" kicks off with an odd-angled dialogue between Caine and Knuffke. "Downward Spiral" brings the album to a close with a nimble, circling figures that draw an aural picture of the title. "I wanted to include all these different styles of playing trio," Caine says of Calibrated Thickness. Despite being a more traditional setting than many of the pianist's projects--his eccentric, style-smashing reimaginings of classical repertoire come immediately to mind--the piano trio offers no less opportunity for Caine to show off his broad-spectrum tastes and approaches. From his early days backing soul-jazz horn players in Philly nightclubs through his convention-defying work with Downtown New York avant-gardists and adventurous classical ensembles to his always-surprising catalogue as a leader, all facets of Caine's diverse artistry are contained herein.